Questions of Capoeira’s origins create controversy. Since it is from a time that pre-dates audio-video technology, and with few written records, much of our current understanding comes from legend and lore. So, one’s beliefs about Capoeira’s genesis can only be a matter of perspective, and is in fact part of the game itself. Despite the many controversies, most agree that Capoeira is a Brazilian-born art form derived from African ritualistic and martial arts traditions. The intermingling of groups such as the Yoruba, Ashanti, Mandinka and Imbangala in oppressive conditions gave rise to game now played around the world. Capoeira is a child of the ma’afa or “great tragedy”. Between 1500 and the early 1900s, millions of West and Central Africans were captured and sold into slavery. Taken from their homes and suffering months at sea with little or no food, the survivors arrived in North and South American ports, only to be put to work on sugar cane, rice, tobacco and/or coffee plantations. In Brazil in particular, the enslaved were subject to inhuman living and working conditions. As to make communication and revolt difficult, enslaved people were separated from those with whom they shared a native tongue. Capoeira manifested, and grew as an art, during the rare moments the enslaved were permitted leisure and community. In those times, traditional African elements of music, dance, combat and play were fused in contest, celebration and remembrance. Brazil’s rich history reveals that Capoeira’s appearance varied over time, and manifested in distinct ways in different regions. 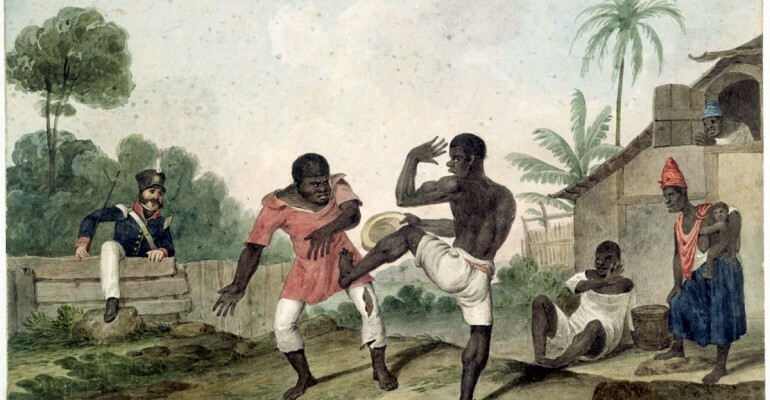 In the 1600s, a rudimentary form of Capoeira was used in defence of the quilombos: well populated forest compounds established by escaped slaves. In Rio de Janeiro, there are accounts of Capoeira as early as 1770. However, northeast Brazil is generally considered Capoeira’s home: the two most influential Capoeiristas, Mestre Bimba and Mestre Pastinha, hail from that region. They each technically refined and legitimised Capoeria. For, even off the plantation or away from the quilombo, the art form was considered degenerate and criminal. In 1888, the Lei Aurea (Golden Law) was passed. It granted “freedom” to the enslaved, in social practice however, little really changed. There was not much work available and, generally, newly “free” people were neither economically independent nor socially accepted by Euro-Brazilians. Many former slaves had little choice but to work on plantations in exchange for room and board. Not only did they fall into the country’s lowest socio-economic bracket, their cultural expressions and practices were held up to contempt. The most scorned expression was Capoeira. In 1890, it was outlawed, and for decades after capoeiristas were hunted, beaten, imprisoned and even killed. Yet, because of their infamy and combat expertise capoeiristas were feared and respected. In major cities, like Rio de Janeiro, they were hired by politicians and organised crime alike. In the 1920s, Manoel dos reis Machado (known to capoeristas everywhere as Mestre Bimba) brought capoeira from the streets into mainstream society. He developed the “Luta regional bahia” (or “Regional” -Hey-jo-nal-) a style that incorporated moves and training techniques from other martial arts and instituted a belt or cordero system, and a set of learning sequences. In 1937, he became the first person in Brazil legally permitted to teach Capoeira. In 1942, Vincent Ferreira Pastinha, (Mestre Pastinha) opened the Centro “Esportivo de Capoeira Angola” in Pelorinho. His game, marked by its slow, controlled movements, inspired a style now called “Angola”. The next most notable change was effected by the Senzala group. Comprised of 3 brothers and 2 friends not affiliated with a school, these five trained intensely – pushing each other to their limits. In the 60s, they took the movement to new heights and spawned countless mestres; many of whom in turn started their own groups. In the 1970’s, mestres travelled to the U.S. and Europe for shows. Some stayed to teach. Capoeira’s most recent evolution has produced Benguela: most easily described as a game that meets Regional and Angola half way. It is very strategic; played quite close to the floor and emphasizes trickery and misdirection. In a mere decade, Benguela has become extremely popular. It owes this success, in part, to Capoeira’s now international roots. Once the recreation of Brazilian plantation workers, the game has grown and evolved inside and outside of its country of origin. Today, there are few countries in the world without a Capoeira school: students in places like Indonesia, France and Australia learn and adapt the art. Through its songs, rhythms and myth, Capoeira takes its history with it where ever it travels. This history keeps it in conversation with the universal themes of liberation, wisdom and joy, and in an embrace with the highest aspirations of the human spirit.